The Fair City of Perth has made quite a name for itself with art and sculpture on display in many parts of the city. The works of J D Fergusson, one of the "Scottish Colourists" are on display in a former waterworks on the banks of the river Tay and there are other sculptures spread around the city. But the largest collection is in a series of three parks on the north bank of the Tay - Norie-Miller Park, Rodney Gardens and Bellwood Riverside Park. 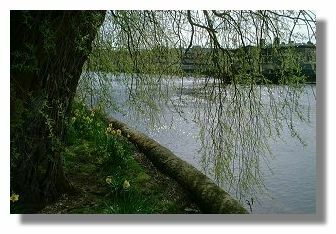 There are many flowers, trees and shrubs in the parks and, of course, the silvery Tay is a constant backdrop. But even for people who do not normally visit art galleries, the works in the parkland setting are interesting - and in some cases, amusing. This feature presents just a selection of the many artworks in display. 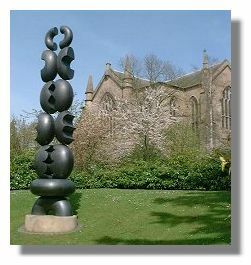 The text is based on a leaflet on the Perth Sculpture Trail by the Perthshire Public Art Trust. The picture here is of "Millais Viewpoint" by Tim Shutter. 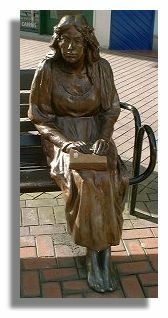 John Everett Millais painted many of his famous works in Perth and the moulded picture frame of this sculpture makes Perth part of this work of art. One of Millais' famous pictures is "Autumn Leaves" and these form part of the frame. 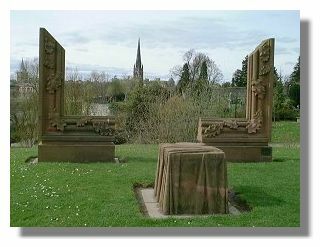 The cut corners refer to immortality and are reminders of Effie Gray, Millais' wife (and at one time wife of Ruskin) who is buried with her children in the kirkyard seen through the frame. There are three works by David Wilson which were inspired by the writings of the town planner and botanist Patrick Geddes (who spent is childhood nearby, in Perth and was educated at Perth Academy). "Outwith Within, Seed" (on the left) and "Outwith Within, Leaf" allude to the inner world of the spirit which Geddes thought should be more familiar and real than the "out world". There are three waymarkers around the park, referring to the seasonal changes of decay and renewal through the seed pod (dry and empty but potent), the bud (symbol of regeneration) and the leaf (the basis for all growing vegetation). 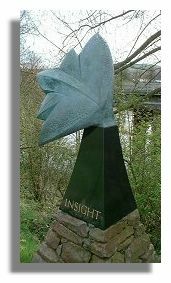 Benchmark by John Creed consists of a main structure which evokes a feeling of permanence in contrast to the opposing forces of river and tide which are symbolised by the spirals. At the same time, the sculpture acts as a resting place, facing the river, for people wandering around the garden. The smaller structures spread up the hill represent the datum points used in Ordnance Surveys to indicate river levels. Evergreen by Kenny Munro is made from granite and bronze and represents the many spires of the churches in Perth. 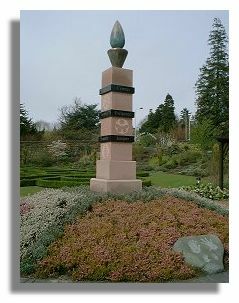 The bronze finial, words and images allude to the environmental thinking of Sir Patrick Geddes. The sculpture is surrounded by red and white heather - the stones have hand prints of members of the community in Perth. People can walk through "River Arch" by Doug Cocker which is based on the concept of the river and the two main bridges over the Tay in Perth. One element of the granite arch has soft, curves to suggest the eddies of the river, while the other has a harder geometrical shape to represent the man-made bridges. As can be seen, in springtime there are waves of daffodils nearby. Phil Johnson obviously has a sense of humour - his litter bins are amusing works of art with titles such as "Deschampsia Caespitosa" (though it hardly looks like a cesspit). They are deliberately tall, so that they are visible from a distance and the galvanised mild steel above the receptacles represent the surrounding flora and fauna with references to water, birds and botanical species found in the parks. And what do these receptacles remind you of? 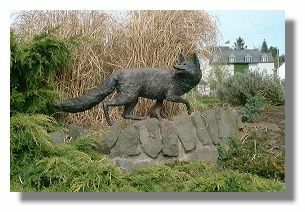 In the carefully designed, man-made cultured gardens, this bronze resin sculpture of "Foxtrot Ridge" is a reminder of the wildlife which is still very much a part of the environment - especially these days as the fox adapts to an urban life-style. The Dance Within by Paul Eugene Riley is a symbolic totem pole which "celebrates the rhythms of life itself". 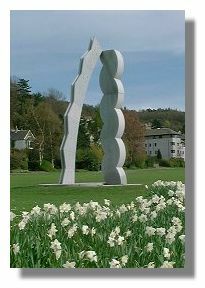 This particular sculpture is in the Norie-Miller Park which was presented to the City of Perth by Sir Stanley Norie-Miller who was born in Perth and later joined the insurance company founded in Perth by his father. Sir Stanley played an important part in creating General Accident, one of the UK's most important insurance companies. As visitors wander round the gardens, admiring the sculptures, flowers, trees and shrubs, they are never far from the river Tay - and the City of Perth on the other side of the river. There are claims that the Tay is Scotland's river but that is based on taking its source beyond Loch Tay (the name is only applied after it leaves the loch) and the 25 miles of the Tay estuary before it reaches the North Sea. Regardless of whether it can claim the title, there is no doubt that it is an important river. It has been written about with admiration since the days of the Romans who compared it to the Tiber. Comparison with the "puny Tiber" is dismissed by locals, however. 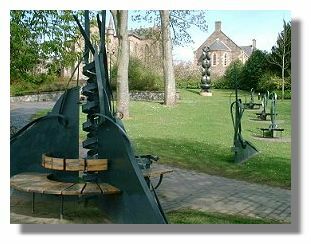 As mentioned in the introduction, the Perth Sculpture Trail features works of art around the city, not just in the Norie-Miller Park, Rodney Gardens and Bellwood Riverside Park. 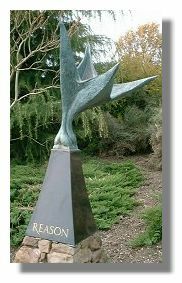 There is a striking sculpture outside the Fergusson Gallery and the Perth poet William Souter is remembered with art work in the High Street named after one of his poems, Nae Day Sae Dark . And of course Sir Walter Scott's "Fair Maid of Perth" is not forgotten, as she sits demurely further down the High Street.